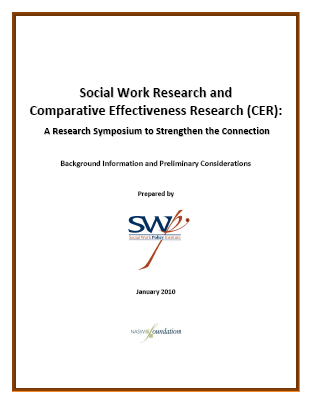 On November 16, 2009 the Social Work Policy Institute (SWPI) will convene a think tank meeting, Social Work Research and Comparative Effectiveness Research (CER): A Research Symposium to Strengthen the Connection. This symposium will examine how the social work profession might best contribute to the expanding attention to CER. The goal is to develop an agenda for action that addresses areas for further social work research, training of researchers, interdisciplinary collaborations, research/practice connections, and communication and outreach efforts.